The 2016 Mazda6 is more than just an elegant and sophisticated cruiser. This is a highly sophisticated and well-built mid-size sedan. There’s no denying the Mazda6 is the grounded grown-up to the Mazda3’s fun-loving teen ways in the Japanese automaker’s lineup. Oozing with class and sophistication, along with the latest in Mazda’s SKYACTIV technology, the 2016 Mazda6 is a formidable midsize car worthy of your attention and consideration. With three models available in the lineup (GX, GS, GT), there’s really a Mazda6 for everyone and every need. Blissfully, regardless of which model you choose, you’ll drive away with Mazda’s fabulous SKYACTIV-G 2.5L 4-cylinder mill that produces 184 horsepower and 185 lb-ft of torque. 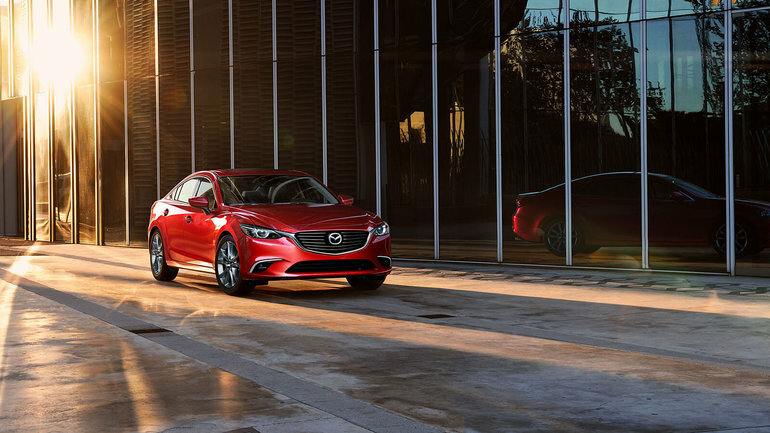 There are also three transmission choices, a SKYACTIV 6-speed manual, SKYACTIV 6-speed automatic, and a SKYACTIV 6-speed automatic with i-ELOOP regenerative braking technology that captures kinetic energy as you slow down. The combination of SKYACTIV engine and transmission is truly something incredible. The way the two units work together as one is near perfection. Driving the 2016 Mazda6 is not disappointing in any way, and is sure to put a huge smile on your face, mostly thanks to SKYACTIV. There’s no denying that the exterior design and look of the 2016 Mazda6 is what truly elevates its levels of elegance and sophistication. Available 17” or 19” wheels, along with fluid, flowing lines sculpt the Mazda6’s flanks and keeps it looking poised and ready to pounce. Carried over from the 2015 MY, the 2016 Mazda6 continues to feature a lighter and stronger SKYACTIV-Body that aids in driving dynamics to combine control and efficiency. There’s also the highly intelligent i-ACTIVSENSE that automatically senses the Mazda6’s surroundings for things like nighttime lighting, potential collisions, and even the proximity of other vehicles on the road. Then there’s Mazda’s intuitive and easy-to-use HMI cockpit design. The 2016 Mazda6 features the onboard infotainment control knob we’ve all come to know and love for easy access to all information housed in the 7” floating touchscreen on the dash. The 2016 Mazda6 also features an available 11-speaker Bose Surround Sound audio system that works in conjunction with the optional perforated leather seating to enhance the acoustic experience while you’re in the car. The 2016 Mazda6 is more than just an elegant and sophisticated cruiser. This is a highly sophisticated and well-built mid-size sedan. The Mazda6 features all the latest in in-car technology and on-road safety. Dynamic and exhilarating to drive, the 2016 Mazda6 has much to offer. Stop by City Mazda today to take a closer look at the 2016 Mazda6 and speak to our experts about how this midsize sedan could be perfect for you. And don’t forget to book a test drive, too.